Preheat oven to 200C/180C fan forced. Line a baking tray with baking paper. Spray mushrooms with oil. Place on prepared tray. Roast for 5 minutes. Add tomatoes; spray with oil. Roast for 15 minutes more or untilmushrooms are tender and tomatoes split. Meanwhile, whisk eggs, egg whites, and cream in a large jug. Melt butter in a large frying pan over moderate heat. Add the egg mixture, cook for 30 seconds. Gently stir egg mixture from outer edges to centre until eggs form creamy curds. Remove from heat; stir in chives. 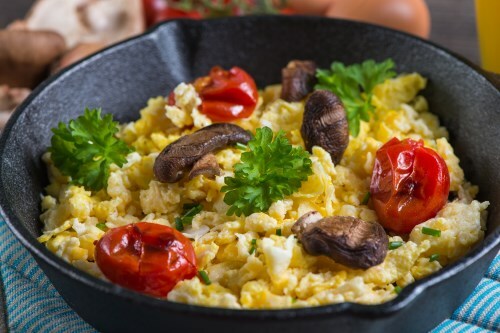 Place mushrooms on plates with scrambled eggs and tomatoes. Sprinkle with black pepper, then serve at once.